Editor’s note: After we published the tutorial about saving data in plist file, some readers asked about Core Data and how we can use it to save persistent information. This week, we work with Ziad Tamim, an independent iOS developer, to give you an introduction of Core Data and work with you to build a sample app using Core Data. This tutorial talks about persistence on iPhone (or other iOS devices). What I mean by persistence is to make data that’s in your apps stay around between application launches. Persistence lets users store persistent data and also retrieve it, so that users don’t have to reenter all their data each time they use their applications. There are multiple ways to store data in iOS devices but most of them aren’t good enough to store a complicated data. They are usually used to save settings or to preload some data such as “Property List” and “Archiving Objects”. So that’s why we’ll go through Core Data to see how you can utilize it to manage data in database. The focus of the tutorial is to provide a practical introduction of Core Data framework. I expect you’ve already gone through our tutorials about Storyboard and UITableView. 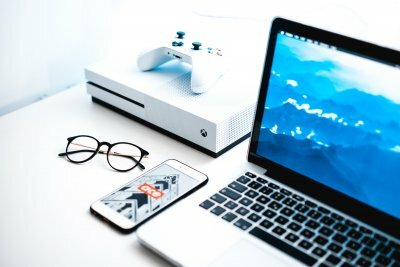 I will not give in-depth explanation about how to create view controller in Storyboard but you can always refer to the earlier tutorials to gain better understanding. When we talk about persistent data, people probably think of database. If you are familiar with Oracle or MySQL, you know that relational database stores data in the form of table, row and column, and it usually facilitates access through what-so-called SQL query. However, don’t mix up Core Data with database. Though SQLite database is the default persistent store for Core Data on iPhone, Core Data is not a relational database. It is actually a framework that lets developers store (or retrieve) data in database in an object-oriented way. With Core Data, you can easily map the objects in your apps to the table records in the database without even knowing any SQL. To illustrate the concept, let’s begin and create your first app using Core Data. This app is called My Store. It is a very simple app that stores all devices you have by collecting the name, version, company. First let’s create a project with Core Data. 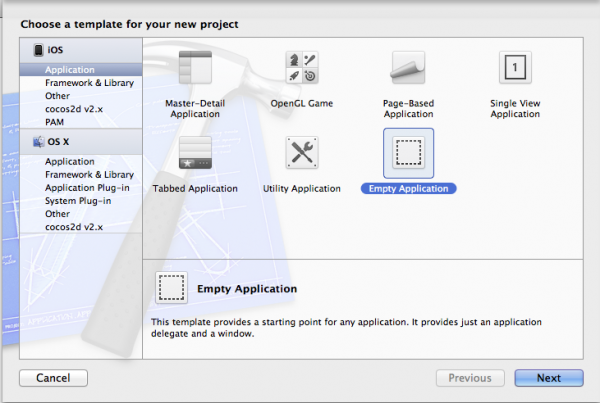 Open Xcode and create a new Project, choose the template Empty Application as shown below. 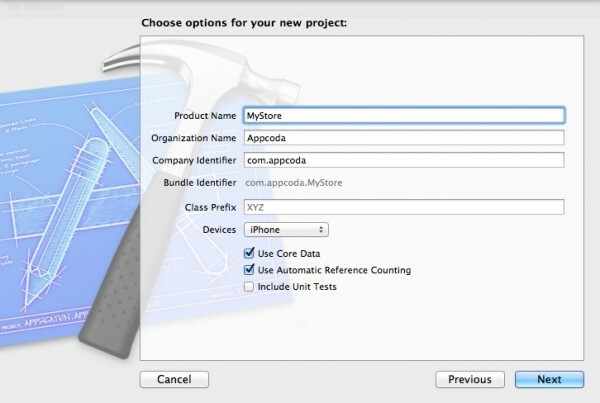 At the next screen, enter MyStore as a name of the project, select iPhone in Devices family and don’t forget to select the options Use Storyboards, Use Core Data, Use Automatic Reference Counting. Press next and create. Managed Object Model – It describes the schema that you use in the app. If you have a database background, think of this as the database schema. However, the schema is represented by a collection of objects (also known as entities). In Xcode, the Managed Object Model is defined in a file with the extension .xcdatamodeld. You can use the visual editor to define the entities and their attributes, as well as, relationships. Persistent Store Coordinator – SQLite is the default persistent store in iOS. However, Core Data allows developers to setup multiple stores containing different entities. 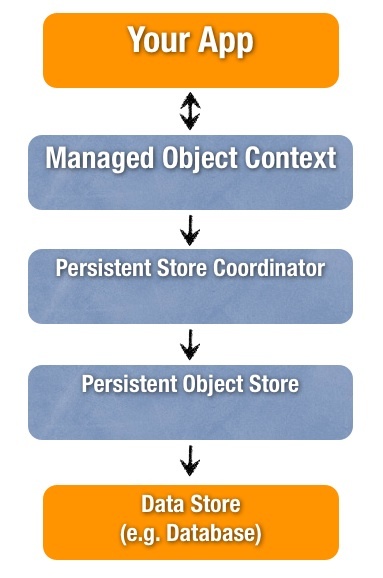 The Persistent Store Coordinator is the party responsible to manage different persistent object stores and save the objects to the stores. Forget about it you don’t understand what it is. You’ll not interact with Persistent Store Coordinator directly when using Core Data. Managed Object Context – Think of it as a “scratch pad” containing objects that interacts with data in persistent store. Its job is to manage objects created and returned using Core Data. Among the components in the Core Data Stack, the Managed Object Context is the one you’ll work with for most of the time. In general, whenever you need to fetch and save objects in persistent store, the context is the first component you’ll talk to. Let’s move on to build the app. The first step is to open the Data Model named MyStore.xcdatamodeld and define the object model. Here we’ll define a Device entity that will be used to store the device information to database. 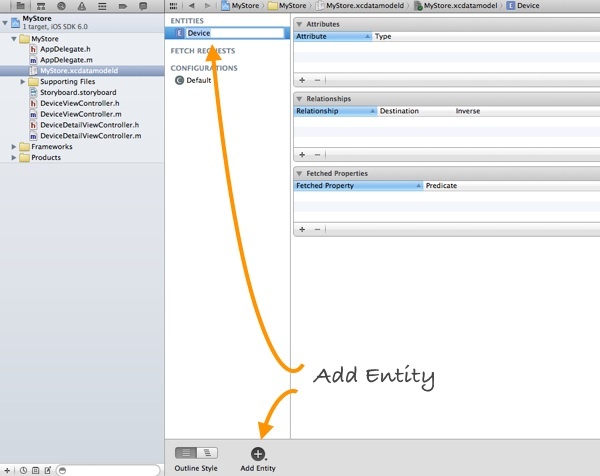 To create an entity, click the + button in the bottom-left of the editor view and name the entity as Device. Once you create a new entity, you need to add attributes to it. Click on the + button in the attributes section to do that. Add three attributes including name, version and company. Set the type as String. Note: While we encourage you to build the user interface, you can also skip the procedures and download the project template from here. The template already comes with the Storyboard and set up all the view controller classes for you. This gives you a good starting point to work on Core Data. If you use the template, you can skip this section and go directly to the “Diving Core Data” section. The next thing we need to do is to create the Storyboard that defines the views of our app. 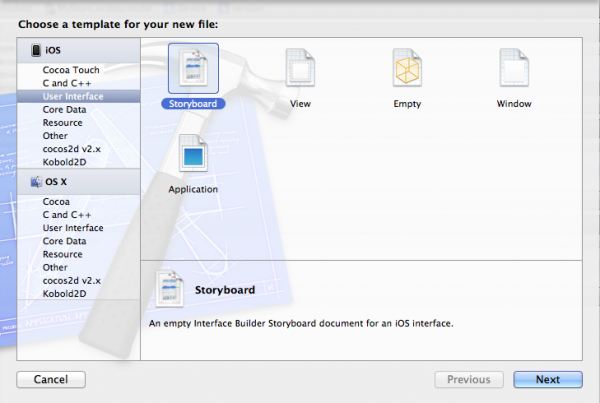 Navigate to File > New > New File and choose Storyboard in the User Interface template. Click next and select the iPhone device family, click create. Once created, make sure to set the “Storyboard” you’ve just created as the main storyboard in the project setting. First, drag a Table View Controller and embed it in a Navigation Controller. 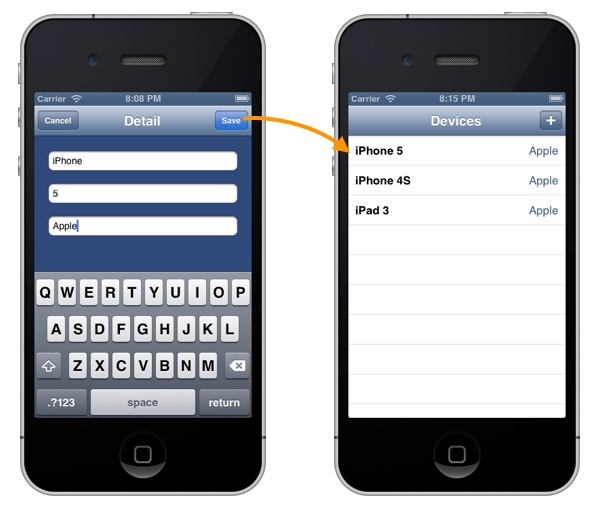 Drag a button to the top-right part of navigation bar and set the identifier as “Add”. This will automatically change the button to a “+” button. Next, select the prototype cell and change its style to “Right Detail”. Drag a View Controller to the Storyboard and add a Navigation Bar to the top of the screen. Next, drag two buttons into the navigation bar. Name one as “Cancel” and the other one as “Save”. In the content view, add three text fields and name the placeholder attributes as “Name”, “Version” and “Company”. This detail view will be shown when user taps the “+” button in the table view controller. So finally, press and hold the Control key, click the “+” button and drag towards the detail view controller. 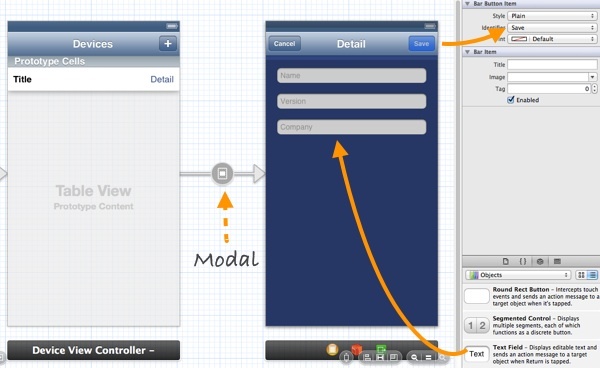 Select “Modal” as the Segue action to connect the table view controller and detail view controller. Create a new class by right-clicking on the MyStore folder > New File > Objective-C class, and name the class as DeviceViewController. Make it as a subclass of UITableViewController. 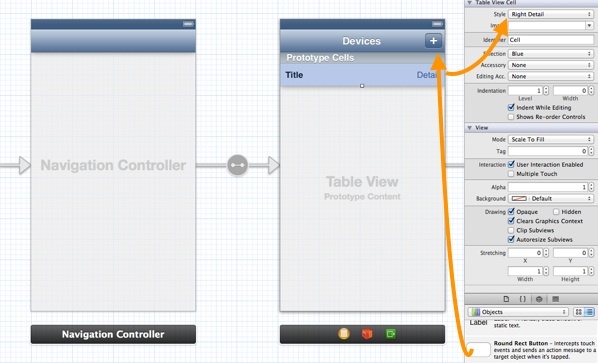 Navigate to the Storyboard, select the Table View Controller and associate it with the DeviceViewController class. Once done, do the same steps to create a new class named DeviceDetailViewControllerUIViewController. Again, go to Storyboard and set the custom class of the detail view controller as the “DeviceDetailViewController”. Lastly, wire up the UITextFields to the DeviceDetailViewController header file and create two action methods for the save and cancel buttons respectively. We’ll look into the implementation one by one. Recalled that we’ve selected the Core Data option when creating the project, Xcode automatically defines a managed object context in AppDelegate. This method allows us to retrieve the managed object context from the AppDelegate. Later we’ll use the context to save the device data. When user taps the “Cancel” button, we expect the app to close the detail view controller. Line 2 of the above code invokes the dismissViewControllerAnimated method to dismiss the current view controller with animation. For the “save” method, we first grab the managed object context. Every object that Core Data stores is inherited from NSManagedObject. So we first create a new instance of NSManagedObject for the “Device” entity that we’ve defined in the object model. NSEntityDescription class provides a method named “insertNewObjectForEntityForName” for developer to create a managed object. Once you created the managed object (i.e. newDevice), you can set the attributes (name, version, company) using the user input. Lastly, we call up the “save:” method of the context to save the object into database. You can now hit the Run button to try out your app. Tap the “+” button to bring up the Detail View and save a new device. However, the new device is not yet displayed in the table. Let’s move on to see how you can fetch the device information from database. Open DeviceViewController.m, add a “devices” property to it so we can save all the devices received. Like what we’ve done in the Detail View Controller, we first grab the managed object context. To fetch device information from database, the code above creates a new instance of NSFetchRequest and set the entity Device and invokes “executeFetchRequest” method to retrieve all the devices from the database. If you are familiar with relational databases, this instance works like the SELECT clause. Note: If you’re new to viewDidAppear method, it is a method that will be called automatically every time a view is displayed. It’s unlike the viewDidLoad method that is invoked once when the controller is loaded. If you have used UITableViewController before, the code above is the simple way to display data into the table view. If you check the code you will notice the NSMangedObject is pretty much like NSDictionary. It gathers all the attributes of the entity (i.e. Device) and you can simply use the “valueForKey” method to grab the attribute value. Note: If you’re new to UITableView, you can check out the earlier tutorials about UITableView. That’s it. Let’s try to run the app and test it. If everything is okay, your app should like this. Try to add some devices and the device information should be populated automatically in the table view. It’s a lengthy tutorial but we try to elaborate the implementation as detail as possible so everyone can follow. As you can see, with Core Data, you don’t have to care about SQL to save and retrieve data from database. Everything is done behind the scene. This tutorial kicks off the first part of Core Data series. Later we’ll talk more about object relationship. Lastly, let me end the tutorial with an exercise. Try to complete the app by adding the functions that let user update and delete an existing device by selecting a row in the table view. Hope you enjoy the tutorial and feel to leave us comment. Update: Check out part 2 of the Core Data tutorial series! This is really good – but in trying to add update and delete capabilities I’m struggling to find out how I’d identify the correct record and then update/delete it. After all, there is nothing that makes sure the entries are unique. Should I be looking at NSFetchedResultsController? It’s a great core data tutorial, thx. Thanks for the article on Core Data. It is really good. Here is an open source app that is a must have when working with core data although it could use an easier way to interact with the on device Core Data files.
} –Got a Thread 1:signal SIGABRT – program crashed after i tried to hit save. I have another core data tutorial with the same error new to programming….please any advice?? I’m getting the same error too. Can’t find what I seem to be doing wrong. Can you please post what it says in the console? Getting the same error as well. Felt like I learned quite a bit but stuck with this runtime error. If i chose a tabbed application and manually added the core framework, will the following code still work to obtain the managed context? Why it is giving me an ARC issue? That’s right, it’s maybe a missing. P/S: Add this into tutorial bro !!! Yeah, the same problem I faced… thanks for this! maybe you try to call the function on the wrong object? I face the same issue. Did you figure out the problem. See comment above about this issue– you may need to add the storyboard to your project. Or you may also need to comment out (or remove) the window creation and display code in AppDelegate.m. This is explained in the original instructions above. i have same problem ,, any body can help me?? in the DeviceViewController.m file. Can anyone help? Whats the difference between left/right Detail ? Hi guys, I’m getting the following issue however no errors are reported in the code and it says ‘Build Succeeded’ after I go to run it. Could anyone please help? Such a great tutorial! But the problem I am struggling with is when I try to add a fourth text field for a device, there is bugs. Is there some I need to notice when I add text fields? This tutorial was very helpful.Thanks. Just a question: Is it possible create more complicated queries e.g take devices with version more than 5.1, and how? This part is a little confusing. You mean a new class named DeviceDetailViewController that’s a subclass of UIViewController right? DeviceDetailViewControllerUIViewController. Again, go to Storyboard and set the custom class of the detail view controller as the “DeviceDetailViewController”. DeviceDetailViewController. Make it as a subclass of UITableViewController. Again, go to Storyboard and set the custom class of the detail view controller as the “DeviceDetailViewController”. Thank you for your tutorials and for your work, they are very usefull. Nice tutorial. Got it at the first time. Thanks for clearing the fact that the core data is a different that other Databases like MySQL or SQL server. I was confused with it all the time. Forget about it you don’t understand what it is. Great tutorials! For some reason though when I click “Add” it does not fire up the modal… Any ideas? please help me. i have attributes winnumber Set the type as Integer32. Where I corrected in this project.? thank you. can you help me ? Add Searchbar in tableview with Coredata . Your Source code of the CoreData is not working in my devices!!! Same issue as jadacoast. Applied other suggestions but still getting NSException. Should this tutorial still work for iOS SDK 7.0? Hi guys, i have a question? like implementing core data in a existing project? If you’re running into a runtime exception when you click the + (add) button, you probably didn’t set the subclass for DeviceDetailViewController properly. It should be UIViewController not UITableViewController. The instructions above do not make this clear. Terminating app due to uncaught exception ‘NSInternalInconsistencyException’, reason: ‘-[UITableViewController loadView] loaded the “nXf-mE-RFU-view-uFh-s5-Woc” nib but didn’t get a UITableView. what should i do? anyone can help? It’s really handy for other if you could repost your solution because searching for sajinseethiis really a cumbersome task. and see Rob’s answer regarding UIViewController not UITableViewController. Add button does not trigger seque, anyone know how to fix that? I am not able to create NSManagedObject instance (*newDevices).It doesn’t allow me to write NSManagedObject.In Screenshot ,Just i have Copied.It allows only NSManagedObjectContext and NSManagedObjectModel…. Whats the Problem?? Try importing CoreData at the top. Hi The DeviceDetail Page crashes as soon as I enter the input in textboxes. Any help will be much appreciated? 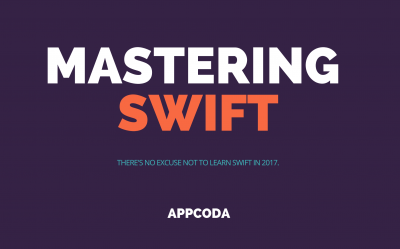 Would it be possible to update the Core Data series of tutorials for Swift 3? thanks! my friend was searching for LITHO TOPS Form 3285 earlier this week and encountered a website with lots of form templates . If you are looking for LITHO TOPS Form 3285 too , here’s a https://goo.gl/xEVYnU. I already worked with CoreData before but some time passed since then. And it looks like some things changed since then. I included CoreData from the beginning, but I couldn’t access the ManagedObjectContext from AppDelegate, like it is explained inside the tutorial. So this didn’t work anymore. Looks like Apple changed something since than, and moved the ManagedObjectContext to the PersistentContainer. hey guys, i am facing problem..